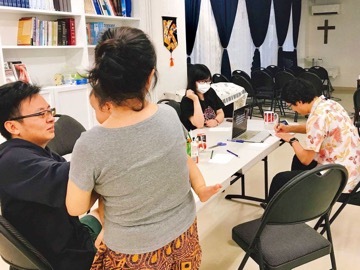 On Sun Sep 24 Kevin, TMC’s missionary staff member from the EFC Macau, launched TMC’s Chinese Department by hosting the first Mandarin language fellowship and Bible time. The Chinese Mandarin group will initially meet one Sunday afternoon each month. Kevin & Grace joined our TMC missionary staff in March of this year, with Kevin’s primary responsibility being the development of our Chinese Department. TMC is indeed moving toward creating intentional space for the multiple cultures and languages the Lord is bringing to TMC—China, Hong Kong, Macau, India, Bangladesh, Zimbabwe, Tanzania, UK, USA, Canada, etc.—while at the same time reaching out locally in Japanese. Located at one of the centers of the world’s largest megacity, TMC is a Christ centered, Bible based, disciple making church, trying to display the multi-faceted glory of God by worshiping and obeying Jesus Christ in a warm and welcoming multicultural setting.